Sometimes it isn’t fear or pain that takes the fun out of a dental visit. The real deterrents often are the uncomfortable and unpleasant-tasting dental materials that are necessary to complete your treatment. Although we understand your concerns, we have a responsibility to honor our commitment to provide the very best in New Holland dentistry. 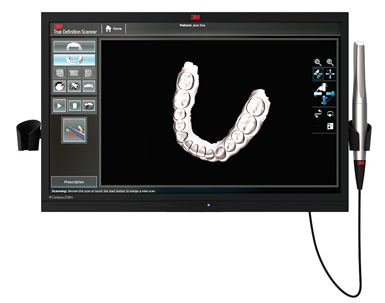 By investing in the 3M™ True Definition Scanner, we have found that we can eliminate the unpleasant impression stage of the crown and bridge process, while simultaneously improving the integrity and quality of the final restoration. The True Definition Scanner enables us to capture 3D video images of your teeth and gums in a matter of seconds. There’s no mess or fuss. In fact, there are none of the inconveniences associated with the traditionally goopy dental impression materials. In addition to creating a more comfortable experience for you, digital impressions allow us to review the results of the procedure on the True Definition Scanner’s touch screen display. Before you leave the chair, we’ll evaluate the impression’s quality and make any necessary preparations before your final restoration is seated. The True Definition Scanner makes it possible for us to strengthen the relationship between our office and the dental lab, thanks to 3M™ ESPE’s Laboratory Software 4.2. Immediately following your appointment, your digital images will be uploaded to the lab to be processed. By eliminating the traditional delivery process, we can increase the speed of our communications with the lab, and you’ll receive your restoration as quickly as possible. This form of digital dental technology can provide our laboratory partners with the information that they’ll need to design your customized dental restoration. The laboratory technician can confidently mark the margins of your crowns, veneers, bridges and other restorations because there is no guesswork. The result is a more accurate and better-fitting restoration. According to the developers and researchers at 3M™ ESPE, the amount of time spent in the dental chair for a single dental crown has decreased by 41 percent because the True Definition Scanner has a remake rate that is consistently less than 1 percent. This means we can produce an accurate impression the first time, ultimately resulting in a first-class restoration for you. Our goal is to provide you with top-quality dentistry while maintaining focus on your comfort and always respecting your time. Our transition into digital dentistry has made those goals easier to achieve. Find out for yourself by contacting us today to experience the benefits of our True Definition Scanner.